Morning drive from Islamabad or Rawalpindi to Taxila. Upon arrival proceed to visit Taxila Museum. Then after have a detailed visit to Julian, Mohra Moradu, Sirkap and Dharma Rajika Stupa. Taxila is a Tehsil in Rawalpindi District of Punjab province situated just off the GT Road about 35 kms northwest of Islamabad the capital city of Pakistan. It is an imperative archaeological site. Taxila accurately claims to be the confluence of the immense civilizations of the world. It came to celebrity when it was under enemy control by Mouriyans, Kushans, Greeks, Scythians and Parthian. 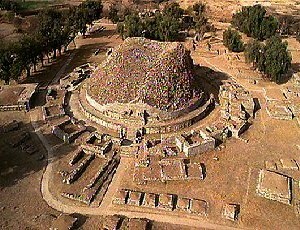 Taxila is the region from where Buddhism traveled to the Far East and Persians, Greeks and Hindus all later left their mark. View the sun set from the ruins of a Buddhist monastery or stroll all the way through streets of a dug up Persian city in the information that there are two older ones buried underneath. In 1980, Taxila was declared a UNESCO World Heritage Site with many locations. Now it has been given a status as the top tourist destination in Pakistan.